A lot of our customers come to us wondering if they can install a new fence, or update their old fence and gate in an area where there is poured concrete or bricks. The primary concern is that they will have to rip up their concrete or brickwork to install the fence or gate, which will add time and cost to the project and even make it unachievable. As the fencing experts, the team at Everlast Services are here to tell you that you can install a fence or a gate on a hardscaped area. There are two ways you can go about it. This option is the best option. However, you will need a core drill which means it may be easier and cheaper to hire a fencing contractor. A core drill is incredibly powerful, and can quickly and easily bore holes in everything from brick, to stone and masonry, and of course, concrete. The beauty of a core drill is that it doesn’t use vibration to create the hole. The problem with using a vibratory method is that it disturbs the area around the hole and can weaken the foundation of the concrete slab or the brickwork. If you’ve contracted someone to do the work for you, make sure they are using a diamond tip core bit, as this will ensure a clean and neat hole with minimal disruption to your property. The correct method for drilling the holes is to make circular cuts. Make sure you choose a trusted contractor because the more accurate they are with the initial drilling, the quicker the entire process will be. Plus, you don’t want them to miss and for your slab to be left pockmarked by any re-drills. Once the holes are drilled, you or your contractor can just follow the regular method of erecting a fence. Just excavate the hole to the required depth, insert the post and pour in the concrete. You can even invest in hole covers to give your concrete or brick area a seamless look. Ideally, your area will be suited to a core drilling process. However, there are certain situations where this just isn’t possible. While core drilling works for most hardscaped areas, it won’t work if you are dealing with tiles or other fragile materials. If your fence is being placed anywhere near underground services, such as cables, sewer systems or water pipes, you may also be prohibited from drilling. Not having core drilling at your disposal doesn’t mean you can’t have a fence, it just means you have to use a bolting post or base plate. Both concrete and brick will be strong enough to hold the weight of a fence or a gate via a bolting post/base plate. To do this, all you have to do is place the post on the base plate and have the bolting post around the bottom of the post. You then bolt the two together to create the point of anchorage. You should also use a construction adhesive to provide extra grip. What Types of Fences Should I Choose? If the core drill option is available to you, you can select whatever type of fence you like. The core drill allows you to build a fence as if you were putting it into an un-hardscaped area, so you don’t have to worry about lateral stress. If you’re using the bolting post and base plate method, you do have to be careful with the materials you select. You need to go for a fencing material that is light. If you go for something heavy, over time the strength of the screw and plates will be affected and you’ll find yourself having to replace your fence far quicker than you’d like. Aluminium slate fencing: Aluminium has always been celebrated for being sturdy and durable, yet incredibly light. This makes it perfect for a base plate and bolting post fence. Steel fencing: Depending on the thickness of your posts and pales, steel fencing could be an ideal choice. Colourbond: Like aluminium, Colorbond is famously light yet still offers plenty in the way of strength and style. Picket fencing: Wooden picket fencing is a classic style, and thanks to the relative lightness of thin wooden pales and posts, it can be used in a base plate and bolting post project. These are just some of the ways that you can provide fencing to a hardscaped area. Of course, the best thing to do is get the help of a quality fencing contractor. 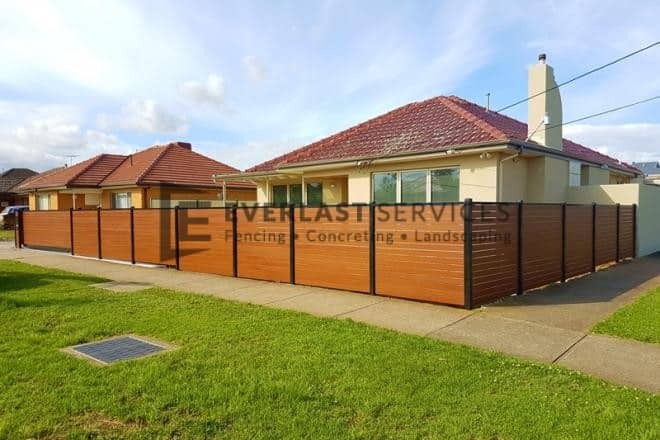 They will be able to assist you in everything from choosing design and materials to ensuring that your fence is complaint with council regulations.